Sometimes, no matter how professional you are, you simply need to go back to the drawing board in order to get a job done right. This is very much the case with the experience that Cosplay1.com had with the making of the Maki Nikishimo Kimono costume. Professional skills, great fabrics, delicate and intricate details and reference photos all created a project that was exciting to do, but also caused some problems once production started. The error was not with the customer or us at Cosplay1.com, simply a challenging order that needed to be handled differently than others of its kind. Here are the details. This project came in in the middle of April from a client that we have worked with before. This client is one of the best that we have, kind, professional, and understanding of the fact that we, too are professionals who take our jobs seriously. We knew upon getting this order that it would take us quite a while to work on it, but we were still willing to try because that is what we do when we are faced with a problem that we don’t know how to solve. 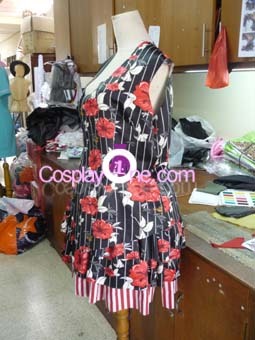 The first thing that we had to do was create the right pattern for the costume. We had all of the details that we needed in the pictures, but creating them from scratch was another matter. We worked from paper, first, then moved onto the right fabric that would be used in the final product. We quite literally went from paper to product. Pencil and paper were the first medium that we used to get the pattern right. After all, what’s the point in having the pattern if we cannot get it right from the basic building block of pen and paper? Once we had it perfected, we were ready for the fabric itself. This involved us using a combination of photo shop and direct to fabric printing to make sure that we got the intricate patterns perfectly. 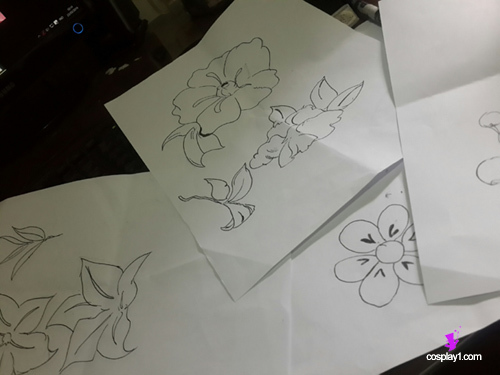 Since the patterns are so detailed and specific, this was the best way to make sure that the finished product was what the client had requested from us in the beginning. This is what makes us at Cosplay1.com so professional: we get the job done right. The faltering between paper and fabric is where we experienced problems in production. We were not able to get the pattern right the first time because it was so detailed and geometric. Once we had the final one, though, we were ready to get to the real thing. We had the perfect photoshop print and then used a direct to fabric pattern printed to the fabric that we had carefully picked out. From there we combined this printed look with embroidery to touch it up and show the authenticity of the design. It was a great finished product that really showed the professional skills that we have here. Once we were satisfied with how it was going to look as a finished product, we used the same combination of photoshop and direct to fabric print outs with the Obi on the waist on the kimono. 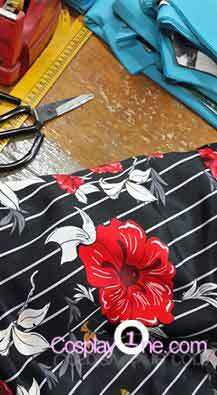 This print out as well as the one of the base of the kimono itself was a smooth and silky satin that perfectly matched what we were going through. It made a very put together final product that we were satisfied with at the end of the project. All together this task took us 45 days to do, from the first scratch of pencil on paper, to the final packing tape on the package at the end of it all. The client was ecstatic with the finished product and appreciated our honesty about the difficulty with the project as well as the fact that we kept working until we got every pattern perfect. That is the work ethic that we have with every one of our employees at Cosplay1.com . We are a professional cosplay business that is looking to bring solid and reliable customers in that appreciate our eye for detail and skills that we have developed with our experience. 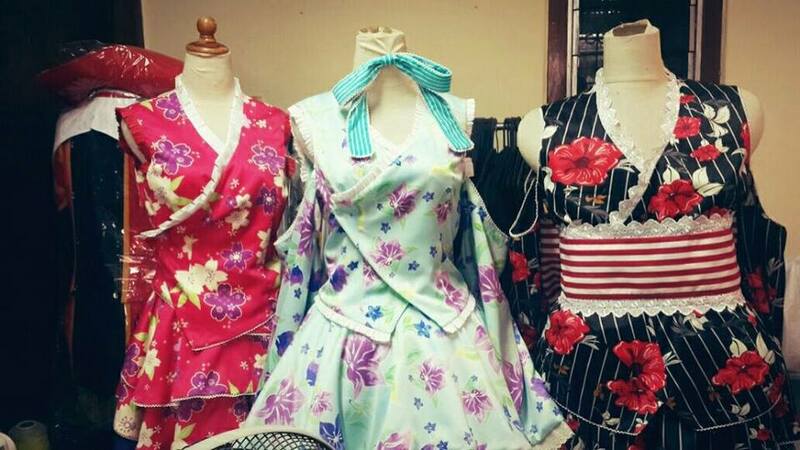 We love the challenge of a hard project such as the work that we had to do with this Maki Nikishimo Kimono Costume. We see every order that comes in as a challenge to improve our skills and educate ourselves on the process of creating a costume that is really going to make a difference in the lives of the customer has come to us. New or old, our customers mean the world to us and we will do what it takes to make sure that they get the best quality work ethic that we can offer: start to finish. Cosplay1.com is proud of the finished product that we were able to give to our client. The Maki Nikishimo Kimono Costume was a difficult but exciting project that allowed us to expand our horizons and learn all sorts of new things that made us a stronger company, both as a collective name and as individuals that all have unique talents and features to bring into it. Professional skill comes from learning and making mistakes. 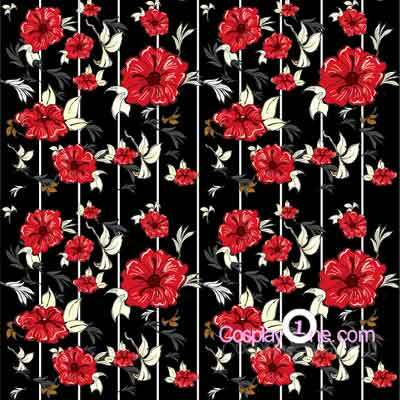 We learned from the experience that this kimono cosplay gave us and we will now know how to make a similar project work so that we are faster and even more streamlined than previous attempts. A fantastic learning oppourtunity from start to finish, we are proud of our successful Maki Nikishimo Kimono Costume and all of the skills that we got from the experience.